Clare Island’s hills, bogs and woodlands make it ideal for walking. There are a variety of walks and climbs to suit all fitness and interest levels. Please note that any veering off these routes onto private land is done so at walker’s own risk. This boggy mountain (pictured above) stands 462m tall. Irish: An Cnoc Mór, meaning “The great hill”. 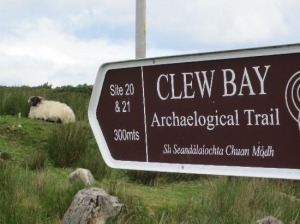 Clare Island has six sites on the Clew Bay Archaeological Trail, all of which are close to roadways and clearly signposted: the 16th century Clare Island Tower House (Granuaile’s Castle), the 13-15th century Cistercian Clare Island Abbey, a Bronze-Age Promontory Fort, an early 19th century Signal Tower, a 5,500-year-old Megalithic Court Tomb and a Bronze-Age open air cooking site or Fulacht Fiadh. There is a guidebook giving the trail seeker an in-depth history and meaning of the sites available from the Heritage Centre. The trailhead is located at a gable wall 50m from pier. Veering right at the first Junction and passing the Granuaile House both loops reach a Y-junction at O Grady’s Guesthouse. Veer left here – following the signpost for ‘All Routes’- and continue along the surfaced roadway for 1km to reach the second ‘bohereen’ on the right. The Fawnglass Loop (green arrows) turns right here – the Knocknaveen Loop continues straight. Following the bohereen uphill and through a series of three gates the Fawnglass Loop reaches q junction with a green track (where it rejoins the Knocknaveen Loop on its return) and turns sharply to the right to begin the descent to the pier again. The Knocknaveen Loop follows the surfaced road for 1.5km to reach a Y-junction where it veers right onto a minor roadway in the direction of the Abbey. Passing the abbey the loop follows the roadway for 1.5km where it turns right onto a grassy track and around the northern side of Knocknaveen Mountain. The green track continues for 2km and rejoins the Fawnglass Loop at a metal gate at the 3 way junction mentioned above. Passing through the gate, both loop descend for 200m to reach another gate which takes the walker onto a surfaced ‘bohereen’ beside the old schoolhouse. Turning right, both loops continue the descent to Capnagower – passing the Gaelic Football pitch on the way. Turning right again the loops follow the road alongside the small beach to reach the trailhead.